NEVER RUN OUT OF HOT WATER AGAIN!Save energy, reduce water waste, and save money. 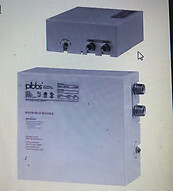 The Pibbs Water Heat Boosters were developed to address the issue of losing hot water at one or all of your shampoo units while servicing clients. The Pibbs Water Heat Boosters are a smart electric tankless water heater that reliably senses the inlet water temperature. 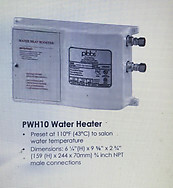 If the incoming water temperature is less than 110°F, the Pibbs water heater knows to raise the temperature. When the water from the central location reaches the desired temperature, the Pibbs Water Heat Booster turns off, saving energy and reducing water waste. No more running out of hot water, no more cold-water shampoos, no more adjusting the water temperature or water flow. Reliable and consistent hot water, when you need it most! Available in two sizes. • Allows you to save energy by complementing a smaller tank type water heater reducing the standby loss of a larger storage type water heater.